The Hermannsburg School of Painters refers to the group of artists who followed after Albert Namatjira, whose watercolour paintings brought the beauty of the West MacDonnell Ranges to the attention of all Australians in the middle of the 20th century. Hermannsburg was Albert Namatjira’s home and the birthplace of several generations of artists who continued the legacy established by Albert. The community itself was established as a Lutheran mission in 1877, originally called the Finke River Mission. It was located in sight of Mt. Hermannsburg, about 125 kms west of Alice Springs. Albert Namatjira had passed on his artistic skills to several generations of artists there, starting with Walter Ebatarinja , and the brothers Otto Pareroultja, Edwin Pareroultja and Reuben Pareroultja. Albert had five sons – Enos Namatjia, Oscar Namatjira, Ewald Namatjira, Keith Namatjira and Maurice Namatjira – and they all took an interest in painting their traditional country. This group of Aboriginal artists was originally inspired to find ways to paint their country by seeing the works of travelling white artists Rex Battarbee and John Gardner, who visited Hermannsburg in 1934. The idea of seeing their ancestral country interpreted by European artists both challenged and inspired the Aboriginal artists to capture the light, beauty and meaning of their own land. 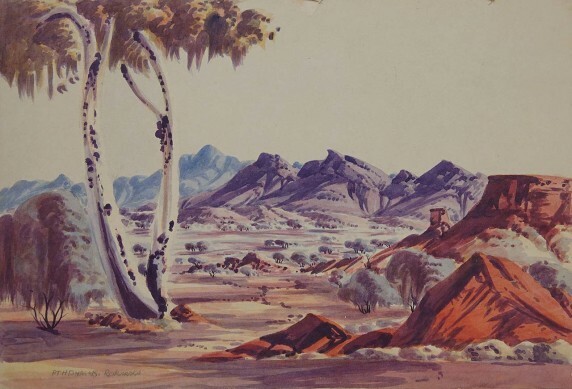 Albert Namatjira travelled with Battarbee in 1936 and the team visited some of the most iconic landscapes of Central Australia, under the expert guidance of Albert. Albert Namatjira enjoyed great success as an artist from the time of his first exhibition, but he also faced intractable problems as a celebrity who was limited by the restricted legal status of Aboriginal people during his lifetime. He died in 1959 at Hermannsburg but his art remains the most highly recognised artwork of Central Australia, and he always achieves substantial prices for paintings at auction. Today the grandchildren of Albert Namatjira are amongst fifteen or so artists whose work reflects the heritage laid down by Albert during his life. Artists currently maintaining the Hermannsburg School ethos include Douglas Kwarlpe, Lenie Namatjira, Ivy Pareroultja, Elton Wirri and Kevin Namatjira. Exhibitions by these artists continue to draw strong audience response and evoke a loyal connection built up over 75 years.